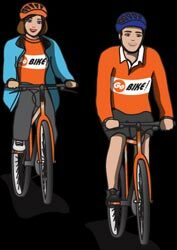 Cycling is a quick, fit and healthy way to travel to work and around Dumfries and Galloway. There are an extensive range of cycle routes to help you get to your destination, so use your pedal power! There are lots of reasons to get back in the saddle. Cycling is fantastic for your health and wealth, but above all, it's great fun. Find out more. We've published a wide range of information to help you get cycling, including maps of cycle routes, contact details for local cycling groups and some top tips. Find out more. Tell us your GoBike stories and suggestions. What do you like best about cycling in Dumfries? What would encourage you to cycle more often? What's stopping you cycling more? Find out more.